Trust that when you walk through the gateway to the other side of everything that a beautiful garden awaits you, even if it doesn't look so at the time. Some of the most scariest of gateways leads to the most rich and exhilarating experiences. Be brave and know that we are always at your side, even if you don't feel it yet, Trust and believe and don't be swayed by the mental energy of failure from yourself or others. Ignore the skeptics and nay-sayers, and perhaps even try to avoid them for awhile while you get your sure footing. Surround yourself with positive energy and people as you traverse the current changes and know that it signals that something new and better is coming your way. Stay on your course with purposeful action, trust yourself, be yourself and follow your heart. Everything is lined up for your success, and trust that it is so. Take time to see the gifts that all around you and spend some time with your angels for love and support anytime you need it. Affirmation: "I am always safe and I my angels are with me always." Article Copyright ©2012 by Sharon Taphorn. All rights reserved. Participation is the name of the game here. We're not here to withdraw, we're here to be here; drawing all our energy currents into this energetic system we are, and showing up at the reunion of all reunions, whole. Life at the Ideafrontier. THE BUTTON IS ABOVE, AND NEW CUSTOMERS WILL RECEIVE 3 MINUTES FREE! Mother Earth, Nature and Archangels. Photos can help also, but are not necessary for the session. directing your intention and light. With all your desire for world Peace, start first by visualizing and accepting personal Peace. Then include others and your world. Prayers for world Peace that are given in desperation have to pass through your emotional and mental bodies. No prayer is ever lost but a prayer given without accepting your personal Peace may be detoured momentarily. 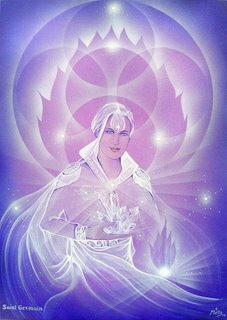 Archangel Zadkiel and Archeia Amethyst work on the seventh ray, which is violet, and represents transmutation and purification through invocation-the act of calling upon the presence of God for intercession. The archangels of the violet ray intensify the powers of mercy, compassion, forgiveness and freedom. Residing in the seat-of-the-soul chakra (which is just below the navel), the violet ray governs the miracle of transformation. The archangels of this ray share a retreat called the Temple of Purification, located over Cuba in the Caribbean. Together they imbue all earthly beings with the desire and power to free themselves and all mankind from self-created and self-inflicted negativity and limitation. 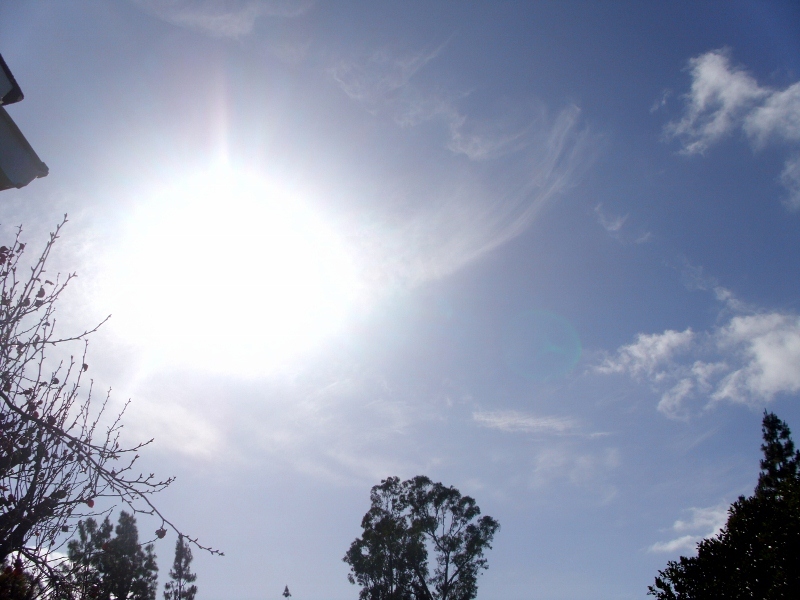 The violet ray, sometimes called the freedom ray, is magnified on Saturday. Zadkiel is the angel of benevolence, mercy and memory, according to Davidson's, A Dictionary of Angels. Some writers say it was Zadkiel who held back Abraham's arm when the patriarch was about to sacrifice his son Isaac. Ronner's, Know Your Angels, has Zadkiel's symbol as the sacrificial knife, apparently because of his interlude with Abraham. Zadkiel and Amethyst's ray, which manifests as the violet flame, has an important role in alchemy, the chemistry of the Middle Ages. Through fire, alchemists of the 16th century learned it was possible to transform base metals into gold. This lesson can be applied on many levels. 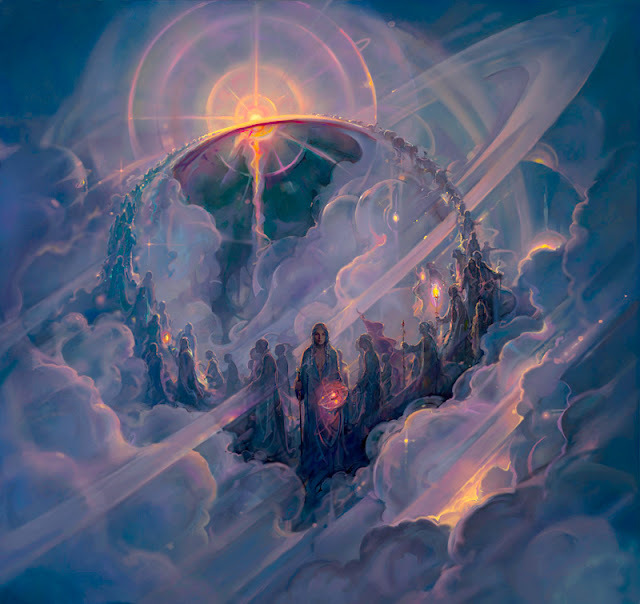 The science of transmutation and change, in theological terms, is the process of transforming lower human consciousness to a higher spiritual vibration. Isaac Newton discovered that a ray of sunlight passing through a prism will separate into seven colors: red, orange, yellow, green, blue, indigo and violet. The color violet has the shortest wavelength but the highest frequency of visible light in the color spectrum. It is the transitional vibration leading to the next octave of color and light. When we talk about transforming ourselves spiritually, we must think of the power of the violet flame. The violet flame is like the spiritual wine of forgiveness, for it represents the quality of mercy in the world. 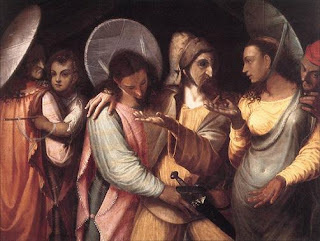 Through the power of forgiveness, fear and anger are transformed back into love as if nothing discordant ever happened. The violet flame is also called the "violet transmuting flame of forgiveness." Forgiveness is not always easy. When angry, we blame, we resent and we hate. These painful feelings do not just go away. But the archangels of the violet ray will intercede if we express the desire to forgive. If we do not know how to forgive ourselves or those we call enemy, God knows and God will show us the way. You need only to try. 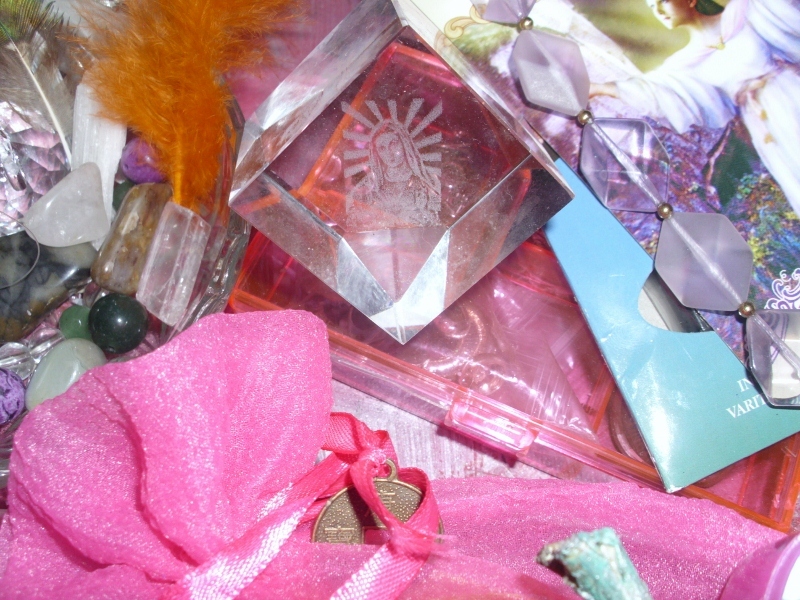 Ask for the gift of forgiveness by calling upon Archangel Zadkiel and Archeia Amethyst. Understanding and forgiveness are universal solvents. They will take the heart of your trouble, which is fear, and transform it into peace, truth and love. Fear is the opposite of love. It is present in every form of discord. It wears the faces of guilt, hate, resentment, anger, anxiety and blame. They are all forms of fear and all can be replaced by love. The violet flame accomplishes the perfect work of truth that sets men and women free from disharmony. When negative emotions are held within the body, the outcome is often a lack of ease, or "dis-ease." This can manifest in the body or in the mind. Illness is one result of negativity taken "to heart" in the body. God's alchemy is within and around us. The divine energy of God is the transformer and the universal unguent, allowing us to move our thought and actions into a place where only love is left. The violet flame is freedom's flame of transmutation. It contains the Holy Spirit's power to transmute the cause and core of density, sin and negative karma. Of course, this is not all happening on the conscious plane. Faith is necessary to feel God's forces working inside our atoms and cells, along with the divine spark in our heart. Inner peace and harmony show outwardly as a result of changing and reshaping our negative thoughts and actions. We then easily move through negative situations by mastering the power of our own consciousness. By visualizing the violet flame, the action of forgiveness and the Holy Spirit, we can use this divine transforming chemistry to change our world. 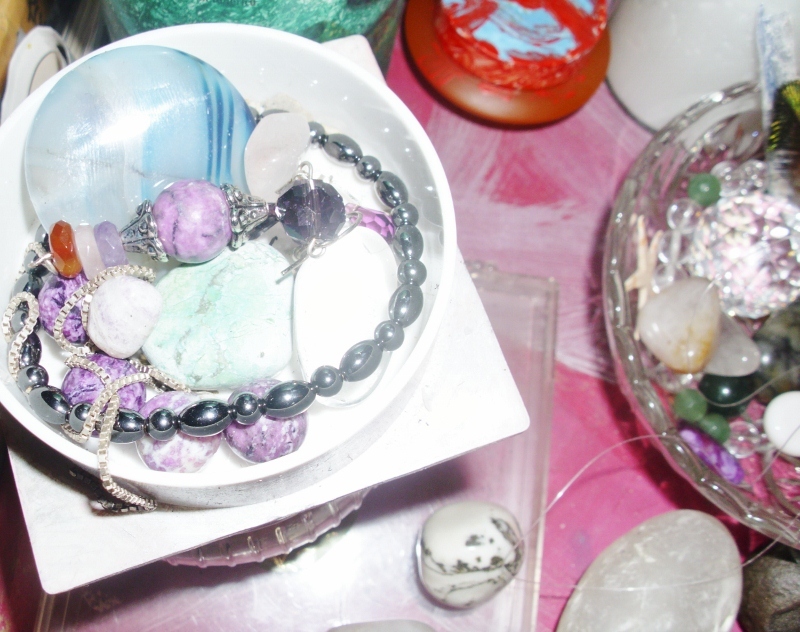 The special crystal jewel, the amethyst, is thought to be the symbolic condensation of the violet ray. 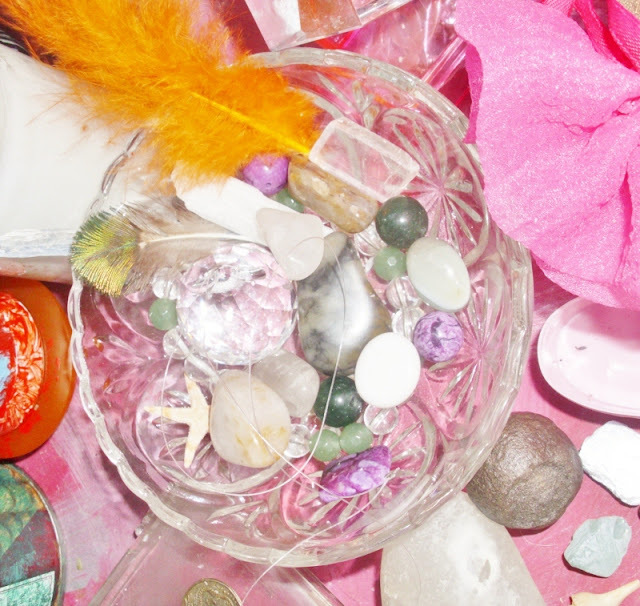 It is the birthstone for the astrological sign of Aquarius, the sign representing freedom and the coming of the "new clear age of consciousness" on this planet. The seventh ray governed by Archangel Zadkiel and Amethyst is an aspect of the Holy Spirit, also referred to as "the comforter." It comes from the center of the white flame of God's potent love. It combines the blue flame of faith with the pink flame of love, to create the spiritual salve of forgiveness. Treasure of My heart, what prevents you from full-scale happiness? There is something in you that calls the shots. You are like an umpire of your life. You decide: "This is good. That isn't." And so you keep score of your life. And so you keep yourself in a state of unhappiness, all because of judgments you form or learn and take to heart as if what transpires is all about you. When you say you are disappointed, you are disappointed. You tell yourself. You label your experiences in life when they are, all the while, nothing but experiences in life. It is not truly for you to assign life its attributes. Let go of being an umpire of your life. Lean toward being an emperor. Emperors are royal. An emperor sits on his throne, and life appears before him. Whoever appears before him appears before him. Like turning pages of a book, one petitioner appears before the emperor and then another. Whatever the situation, he dispenses with it, and moves on to the next. An emperor takes care of his day, and he lets it pass. His fate is to move on. He does not hold on to his judgments. He does not hold on to the outcomes. He moves on. It is not that he washes his hands of life. He simply doesn't hold on to it. He makes quick work of it. All the while, he quietly drinks tea, and, yet, he does not ponder too much. He lets go. You, on the other hand, may be a swashbuckler of life. There you are, sword in hand, ready to declare bankruptcy or whatever the name of the challenges that appear before you. You have many names that you call what appears before you. Obstruction. Onslaught. Unkindness. Repetition. Rejection. Disinterest and so on. Switch your thinking. There is a knock on your door. You do not know ahead of time who knocks on your door. Know ahead of time that it is opportunity knocking at your door. It may be opportunity in disguise, yet it is opportunity. It certainly is an opportunity for you to grow. Consider that life is bringing you vitamins and minerals. Some taste good, and some taste bitter, and, yet, you drink them down, and then that's it. You wash the glass, and you return to a neutral place. There does not have to be a bitter after-taste. You do not cling to it. Vitamins work on their own. You let vitamins be. You let them do their thing. Now let life be. Let life be like inhaling and exhaling. You are free in life. No longer consider that life can put shackles on you. How you absorb life as it arises is up to you. You don't fight. You don't take it all lying down either. You get up, not to fight, not to assess damages, but simply to move forward. And, so, what you may consider difficult goes out the window. You may not be the comptroller of your life, yet you are the climate control of your life. You are the dispenser of peace, or you moil your life. Best to scatter seeds of peace and love. You, beloveds, are the hosts of the Universe. Welcome life as it comes, and do not label it. Or, if you must label it, label it Adventure, or Surprise, or Delight, or Give it a good name. Welcome life and treat it courteously. Don't make an opponent of it. Be intelligent. Be wise. Take life as it comes, and handle it well. Life is not a lion that you have to tame. You cannot tame life. Nevertheless, you can be light-hearted and engage with it. There are aspects of things around you that you may be unaware of. One of the biggest is this: I am here to tell you that the entity that has your name, called Human, may seem to be complete, but it isn't. Part of you is not here! You have heard the expression, the Higher-Self. This is accurate. Part of this Higher- Self of you is in a planning session, co-creating with the otherHigher-Selves of the rest of you in order to create synchronicity - to co-create a new reality with you. I know this may sound confusing, and we will again channel on the subject. 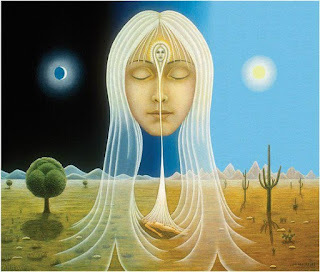 Understand that we must speak of interdimensional things using metaphors in this teaching session, and we will present the following information with the reminder that much of what is to follow is interdimensional and therefore often metaphoric. Listen carefully. For there will be concepts presented that perhaps you will not understand the first time around. Part of you is not here. Part of you is within what some of you have called the "guides and angels" around you. We call it energy. They cannot be numbered, for they are one, yet they are infinite. You have the very essence of spirit around you constantly, and this essence is a loving essence, ready to be activated with compassion. As time changes your relationship to life on Earth is altered. As you begin to attune to your heart and follow your inner knowing, you'll find your choices about where to be moment to moment generate greater ease. This corresponds to a new relationship to time which is expanding in depth and implication, rather then minutes. And, trusting what you feel. 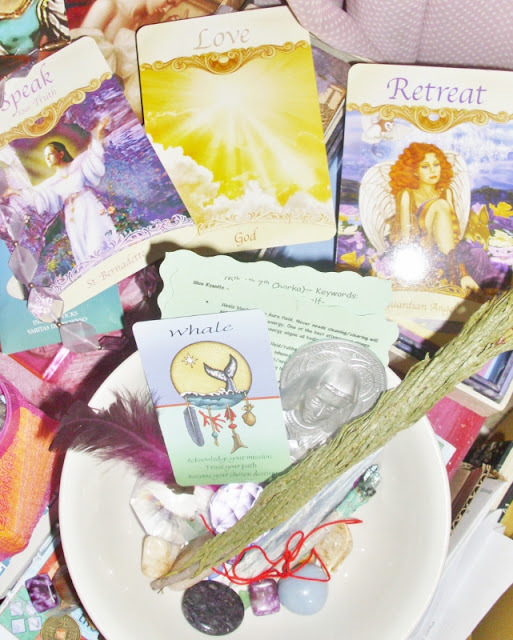 Your angel guidance is to look deeper at all the relationships, people and situations in your life right now and respond to your inner feelings. Feelings that come from inside of your being. The quiet voice within you that says, "Don't do that", or "Don't go there", or "Follow that feather and see where it lands" or perhaps even, "Say hello and smile at that person". 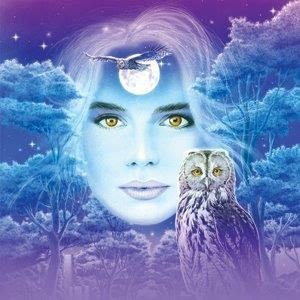 These are all promptings of your inner being, your spirit self that is always connected to your physical self. As you look deeper into your relationships, see the love that underlies all of them. Let that love be your guide. Use discernment in all that you do. Take the gift from everything that you do, read and see before you. If you are reading or listening to something that doesn't feel right, send it love. If it feels completely wrong to you, politely smile and excuse yourself from the situation. If you can't leave it at that moment, take a few deep breaths, feel yourself surrounded by love and just be in the moment. Take in only that which resonates to you in that time, and just leave the rest. It might be helping others at levels that are not a part of your journey. Affirmation: "I trust and am tuned into my inner guidance at all times"
~I am currently offering Distance Healing Sessions for $11.11! Changing our lives requires courage. Changing our lives requires courage. It is easier if we allow ourselves to pick one area at a time and build within a specific area of focus. Change is complicated by our identification with patterns and habits, by our memories of failure and our fears, and yet, when we increasingly remind ourselves that our identity resides in the present, with the awareness we are, not our body, our lifestyle, our memories or our worries, then it becomes eaiser. In all things orienting accurately is empowering. Freedom. The state of being fully free. Freedom. The state of being fully free. What will you be doing in your life when you are free? What shall your world reflect to you? I decree that you have full freedom in this moment. Let yourself feel Peace knowing that you are free to think and feel everything you desire. Let yourself feel Peace knowing that you are fully free to be Light, Love and One. Huge wheels and frisky steeds speed the rate at which the driver's willpower can be realized. This kind of charge makes more of the world accessible to anyone ambitious enough to seize the Chariot's reins. But there is danger in this feeling of freedom, because of the increased rate of change and its power to magnify mistakes in judgment. As a seasoned warrior, the Charioteer is called upon to be extra attentive to the way ahead. As your days become more and more filled with Peace, you will look into your outer world and feel compassion without sympathy. This allows you to share your Peace effectively and fully. When someone feels acknowledged, they become less resistant and begin to allow Peace into their life. So Be It. It is time for you to make your real feelings and beliefs known. Share who you are with yourself and others. Let people see your true nature. Let people feel your wisdom, and follow your heart. Yes, your relationships will change when you 'come out of the closet', ones that aren't evolving will naturally drop away, and others will deepen because you will know that you are loved for who you truly are. Trust and follow your intuition. 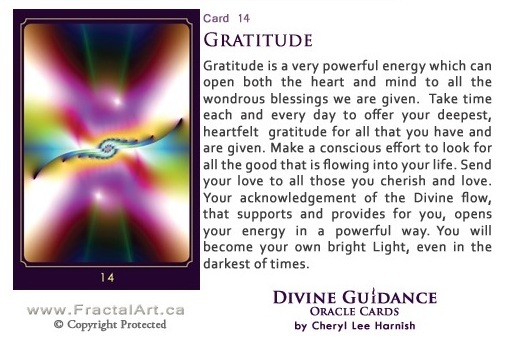 You are being divinely guided right now. Trust your knowingness, the visions, or the inner voice that are trying to share with you to enhance your journey. Know that you are spiritual supported in this process by your guides and angels. Use positive affirmations each morning to assist you in all that you wish to manifest. This is a powerful tool if you choose to use it. Before or immediately after arising, spend a few minutes thinking about your desires. Allow yourself to imagine that they've already manifested. Set your intention for what you would like to create in your day today (and each day). As you go about your day, let go of any judgments about yourself or others. Speak your truth with LOVE. Allow others to get to know the real you. Trust your authentic self, the more authentic you are, the higher the energy and success of all of your projects. Affirmation: "I am living my passion as I am in my truth. I speak my truth with love and compassion." It is time to let go of the old and worn out, so that the new can come in. 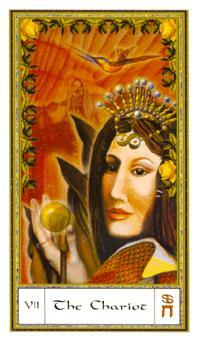 As you are releasing the old, it is important to consciously choose what you want to create next. This will lessen the lag time between, lessen the ups and the down, bring you balance and harmony as you move along your path. When the old moves away and new begins to enter, keep charging ahead, don't take no for an answer, and expect miraculous solutions to appear before you. The more you expect things to be grander, the more grand they will become. To bring in a flow of new and fresh ideas, go outside and play like children. Children offer us a tremendous gift of joyfulness through play. Join some kids at the park, play by yourself. The most important part is to just have some fun. Be in that joyous state and get some fresh air to clear out the cob webs. Spring is here. Affirmation: "I always make the most of the opportunities before me." It's challenging to morph your physical body, while still in it. It's challenging to morph your physical body, while still in it. Cook dinner, exercise, walk the dog, call your friends, learn that new computer program, pray for your brother's wife, meditate, change your tires, prepare your taxes and oh, by the way--tune into the planet and the solar flares and use them to energize your body. The path is meant for Lightworkers like you, yes, but do, by all means, realize the enormity of it all...and celebrate just a bit! You're AWESOME! Happy Equinox. 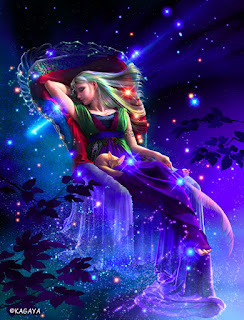 May the personal, planetary, galactic and cosmic balance flow into your whole being with grace and ease! The more you have to share with others. The more light you carry, the more love you feel for everyone and everything. Ask your angels to fill you with more light, as it contains spiritual information and knowledge to assist you on your way. As you learn to walk with more light, you attract to you that which is of a higher vibration and feel more balance and harmony with everything around you. Explore your beautiful world, explore your options, explore the gift of each other. When you look around for other possibilities, more open up for you. It is a good time to make changes in your life. Keep a positive outlook and expect positive results. As you honour and follow the guidance of your heart, the world opens up to your light. Affirmation: "I carry more light each day. I am open to receive the wonders of the Universe." In essence you are growing a new structure. The architecture of your energy reflects the information transmitting energy into form and this is being altered gradually and continually from infusions beyond Earth, which have reached a tipping point and many will awaken today stepping into a new template for their human body. 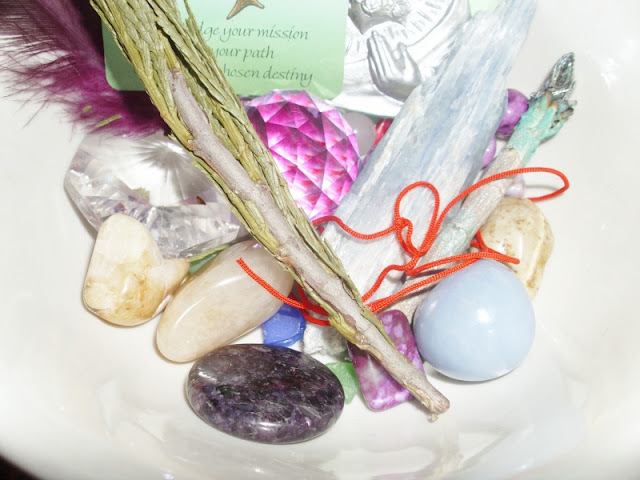 General Meaning: Traditionally, the Magus is one who can demonstrate hands-on magic -- as in healing, transformative rituals, alchemical transmutations, charging of talismans and the like. A modern Magus is any person who completes the circuit between heaven and Earth, one who seeks to bring forth the divine 'gold' within her or himself. A positive attitude and strong potential prime you to achieve something exceptional in the relationship arena. The card in the Love & Me position touches on an aspect of how you perceive yourself with regard to possible intimacy in your life. 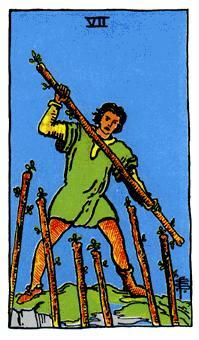 The Seven of Wands in this position points to a personal breakthrough or a moment of triumph. You have done a lot of work on your ability to relate to others and are at the peak of your potential. You are a winner even if the proof hasn't manfested just yet. With such a positive attitude and strong potentials so carefully cultivated, you are bound to make a strong showing on behalf of you and someone you care about. 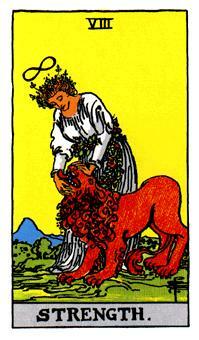 The Seven of this suit generally shows a person who is nearly always successful in working her or his will in the world. This is a person who is truly gifted, standing head and shoulders above the rest, a standard-setter and exemplar that exceeds previous conceptions of what is possible. 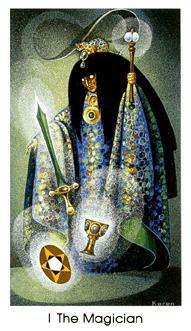 In historical Tarot, this person would most likely be portrayed as an admired and feared warrior who has vanquished his adversaries against all odds, but nowadays such an outstanding feat could just as easily apply to the world of the media, politics or business. Beware of creeping smugness that can be hinted at by this card. Being successful does not make you invincible, and it does not protect you against errors! Enjoy your "fifteen minutes of fame" and then get back to your tasks, or your head will swell, to the detriment of your ability to succeed again. You are carrying a torch which has the power to illuminate, awaken, and inspire the your potential romantic partner to aim high. The card that lands in the Situation position refers to social or circumstantial factors which could be affecting your life at this time. 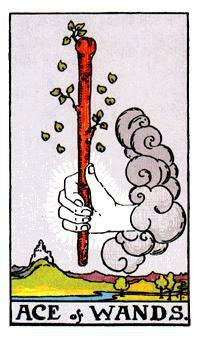 The Ace of Wands in this position reminds us that certain truths unite us despite our other differences. One of these igniting, self-evident truths could be drawing you into deepening an existing relationship or perhaps forming a new one. You and your potential partner may co-create a single vision that you can share. In the context of a forthcoming relationship, you are presented with an excellent opportunity to help each other realize and fulfill mutual dreams. If you remain non-competitive, together you can set an example of both worldly and relationship success that raises people's hopes and inspires them to be the best they can be. The card that lands in the Challenges position refers to ways that you can turn obstacles into stepping stones. The Challenges position helps you get the best out of your relationship situation. it reflects the cutting edge, the learning curve whereby you can turn challenges into win/win victories -- using creativity and a positive attitude. This card can point to recurring themes you have faced in your life -- and to opportunities that may yet present themselves. Can you think of any patterns that are reappearing to affect you now? If so, try to recall how you have reacted in the past. Perhaps you can see new potentials, while noticing the hidden pitfalls too. Can you imagine a different way of responding to the relationship this time around? 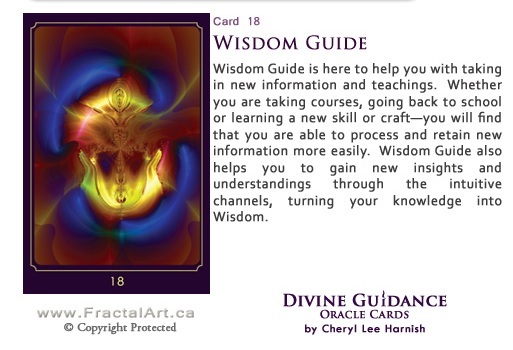 The wisdom of this card can help you turn surprises into strengths, blind spots into windows of opportunity. Bring creativity and flexibility to the way you go relating. Your expanding capacity will become an asset and source of inspiration to your partner. A balance must be struck between survival and spiritual motives in a potential relationship. The Strength card in this position challenges you to calm aroused instincts, angers, and desires without suppressing life force to the point where vitality is lost. In a forthcoming relationship, this may require balancing the urge for control with the urge for natural action. Find the way to enable the raw lust of the animal nature to be civilized by the spiritual power of higher standards. When you find that balance within yourself, you can begin to model it for your possible partner, even offering some leadership during this exciting time. This may be a key to taking a forthcoming relationship to a higher level. As a beautiful spark of Creator light, you are indeed worthy of all that you desire. Decide on clear boundaries and limits and firmly decline to let others step over them. When you value yourself, you become open and friendly, slow to take offense and quick to forgive. 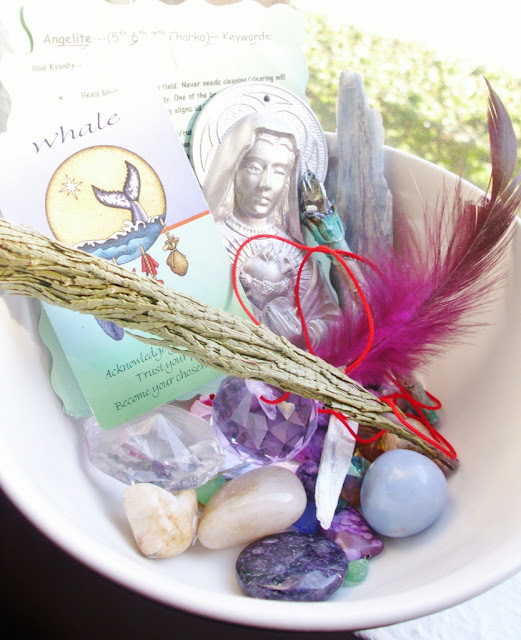 Angel wisdom reminds you that you are like-able and truly love-able. Do not let others press your buttons, or tell you otherwise. Begin by loving yourself. 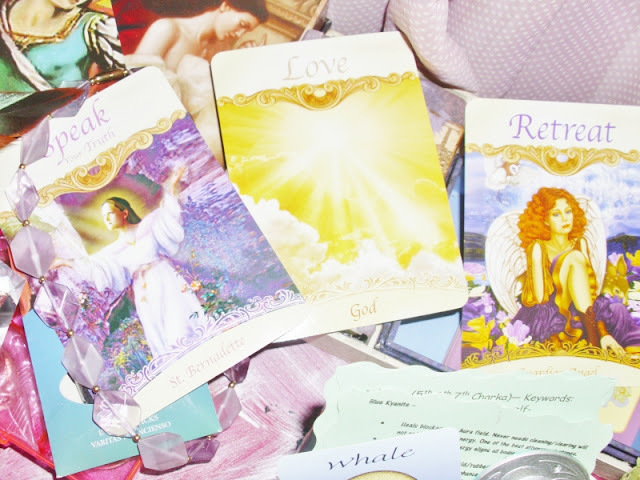 If these seems difficult at first, ask for your angels to step in and surround you with love. When you feel our love it is easier to take the next step towards loving yourself. Pay attention to your dreams, as this is often how we communicate with you. If you need clarity on a dream, ask the Angels to help you better understand the message in a way that your current awareness can relate to it. Trust that this is the perfect time for healing any unfinished business with an authority figure in your life, as this could be holding you back from receiving all the good and wonder you desire in your life. Change of course. Reorganization is needed. Seek out others to help you in reaching your goals. Listen to other's advice. Possible to rely soundly on others now to help you. Teamwork. A new challenge for you and your team. New issues have come into focus and need to be organized and put into proper perspective. Project experienced a setback, but it is now time to regroup and get back to work. Transformation held back or delayed. Inability to let go of something or someone. Change averted. A continuation of the status quo. 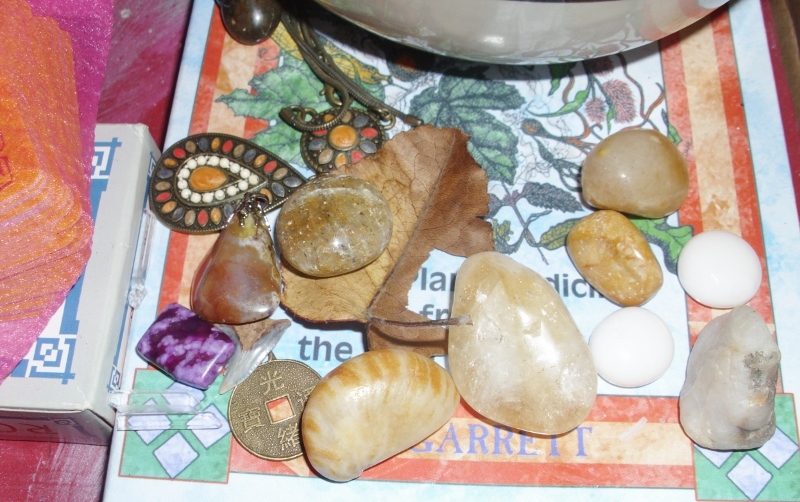 Old energy keeps things stagnant for a while longer. Relationship or job remains unchanged. Stuck. Desire to keep things the way they are at cost of new possibilities. Intimidated by future influences. Timidity. Not the time to trust your own feelings. Something else will be revealed. Wait for it. Getting mired down in the details of a projects. Feeling there is room much to do alone, so you stop working altogether. Tired of waiting for rewards to manifest. Working too hard without taking time out to enjoy the benefits you are receiving. Spending too much time going over the details and not enough time enjoying the journey. Blinded to the truth of a situation. Blocked from seeing what is needed to go forward. An impasse or stalemate without possibility of continuing. Remain calm and do not get defensive. Take a step back before plowing ahead as someone is not seeing things the way you do. A possible block on the horizon to your plans. A warning sign. Someone is stifling you. out of a bad time. A reversal of bad fortune.